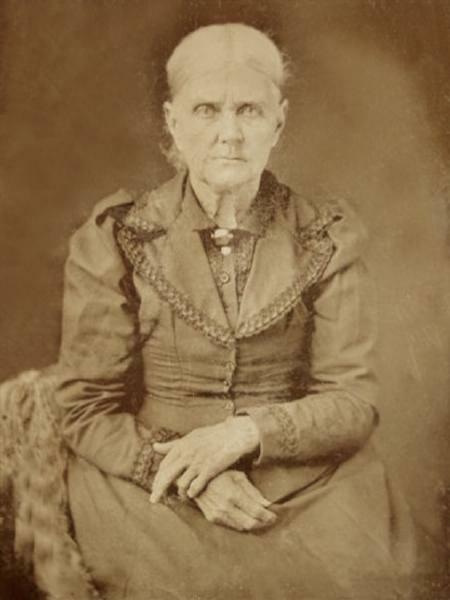 Caroline Elizabeth Bonneau was born on 28 August 1824 in South Carolina. She married Thomas Whitaker Brodnax, son of Robert Brodnax and Olive Taylor Whitaker, on 23 April 1846 in Lowndes County, Alabama. Thomas Whitaker Brodnax and Caroline Elizabeth Bonneau appeared in the US federal census of 1 June 1850 in DeSoto Parish, Louisiana. Other members of the household included Ann Eliza Brodnax, Olive Anna Brodnax and Mary L. Brodnax. Daughter Ann Eliza also was enumeratied living with her grandmother Marcia Pegues Vanorden in Perry County, Alabama. Thomas Whitaker Brodnax was the enumerator for this part of DeSoto Parish. It is noteworthy that the families of three of Marcia Pegues Vanorden's brothers and the son of another brother were living in DeSoto Parish at the time of the 1850 census. Thomas Whitaker Brodnax and Caroline Elizabeth Bonneau appeared in the US federal census of 1 June 1860 in Mansfield, DeSoto Parish, Louisiana. Other members of the household included Olive Anna Brodnax, John Robert Brodnax, Thomas Whitaker Brodnax Jr., William B. Brodnax and Susan M. Brodnax. Thomas Whitaker Brodnax and Caroline Elizabeth Bonneau appeared in the US federal census of 1 June 1870 in Mansfield PO, DeSoto Parish, Louisiana. Other members of the household included John Robert Brodnax, Thomas Whitaker Brodnax Jr., William B. Brodnax, Ester Elizabeth Brodnax and Hugh Brodnax. Caroline Elizabeth Bonneau became a widow at the 16 July 1874 death of her husband Thomas Whitaker Brodnax. William B. Brodnax and Courtney Jennetta Wilson appeared in the US federal census of 1 June 1880 in San Augustine County, Texas. Other members of the household included Caroline Elizabeth Bonneau, Edna Cornelia Brodnax, Mary Olive Brodnax, Ester Elizabeth Brodnax and Paul DeWitt Brodnax. James Thomas Peace and Ester Elizabeth Brodnax appeared in the US federal census of 1 June 1900 in Sabine County, Texas. Other members of the household included Caroline Elizabeth Bonneau, Mattie Olive Peace, Florence Ruby Peace, Henry Theophilus Peace, Mary Ann Peace, Hilda Iris Peace, Hugh Peace and Lillian Claire Peace. Caroline Elizabeth Bonneau died on 6 January 1912 at age 87 in Batesville, Zavala County, Texas. She was interred at Edgewood-Woodlawn Cemetery, Batesville, Zavala County, Texas.